“It’s true. 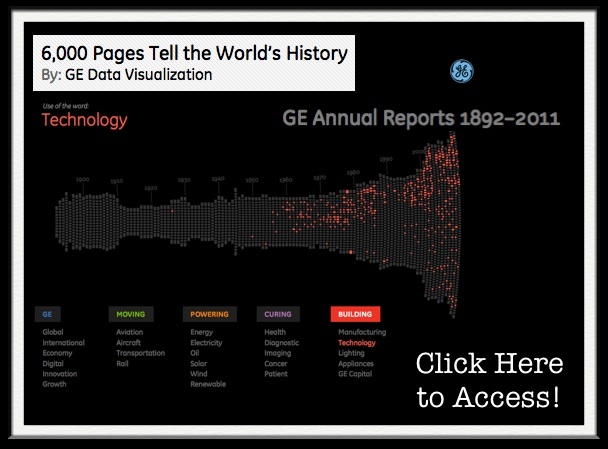 We’ve scanned 6,000 pages of GE’s annual reports to build this interactive visualization. But why? What’s the point? Not only does this provide a rich history of how GE has always been at work building, moving, powering and curing the world, but it is a true reflection of how the economy, U.S. and the world as a whole has progressed from 1892 until 2011. By diving deep into key terms, users can uncover interesting stories about innovation over the last century. Explore for yourself!